November 19 marked a time when notable alumni returned to Central to share the stories of their careers with students – from their Central graduation to present day. Whether it was sharing life and career advice, or giving a lesson on Statistics, the returning alumni elucidated students on how their experiences at Central prepared them for becoming the people whom they are today. Merrill Freedman (208) talked to Ms. Marrow’s International Baccalaureate History class. Upon arriving in the classroom he said “[This is the] first time I’m in a class I would have liked to have taken.” Freedman talked about his college career attending Penn State, pursuing a degree in Radio Television and Film. He noted the importance of history classes when pursuing any degree. He says, “It was in the history classes that I really learned how to write.” Leaving his film degree behind, Freedman became an Industrial Realtor, selling industrial properties like warehouses throughout his life. He notes: “Industrial real estate is hard to get into but once you’re there, it’s fun.” Freedman also spent some time discussing the struggles of running a bakery as a young boy and his time in the Navy. 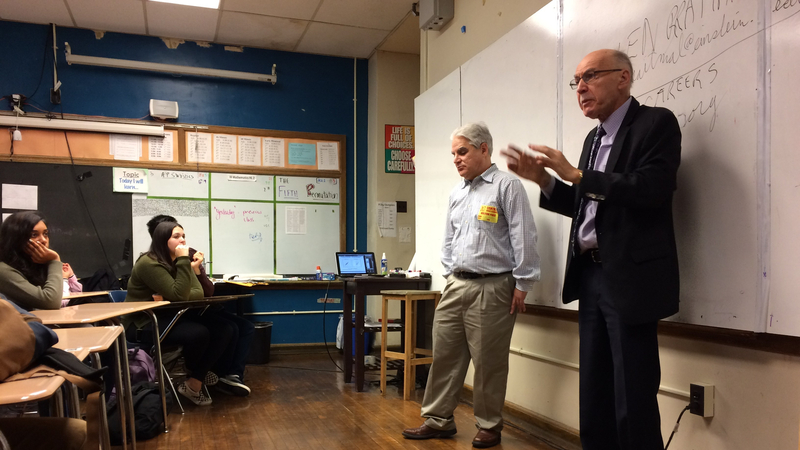 Dr. Ken Goldberg, PhD (237), was welcomed into Mr. Zak’s AP Statistics class to discuss his career as a Statistician working at the Johnson and Johnson Pharmaceutical Company. Dr. Goldberg described the process doctors go through to test new drugs, specifically how an experiment should be properly designed to allow scientists to conclude that their new drug heals a certain medical condition. Dr. Goldberg, since testing a drug for youth depression, has assisted in judging projects at the Delaware County Science Fair, a fair in which many Central students take part. Association and the Chairperson of the Hall of Fame. Burnstein grew up in Logan, Philadelphia. He met his wife at Northeast High School. After graduating college as an English major, Burnstein changed career tracks and became a physician, more specifically, a rheumatologist. Burnstein explained how Central helped shape him as a successful person. Central significantly improved Burnstein’s writing skills, and increased his love for English. Although Burnstein does not have a career in the English area, his sophisticated writing skills help him in the medical field to this day. He is still fully involved in this high school. Steve Burnstein’s biography has been provided by Jordan Carrier (280). Steven Khov (258) is a Pulmonary Critical Care Physician. Dr. Lent Braitman (209) is a bio-statistician with a math major from Temple University and a Sociology PhD from the University of Chicago. A passionate alumnus, Braitman discussed the hybrid of statistics and other fields of science. He asked the class what types of careers people were interested in pursuing and then discussed those careers’ connections to statistics. Chloe Moore (258) works in Urban Planning. Paul H. Steerman (226) is a surgeon. Joseph M. Becker (218) works as a Radiologist.